You know the feeling—sweetness has turned your mouth dry. You feel lightheaded. There’s a strange rush of energy through your arms and legs. You feel like you could run for miles, but you know if you do that, you’ll fall flat on your face. The feeling? A sugar rush. Sometimes you get one when you eat too much dessert at a party…and sometimes you get one the night of Halloween after gorging on your kid’s bucket of candy! A sugar rush does the same thing to adults and kids, so it’s time to find out why you (and your kids) should avoid one this month. Did you know that a sugar rush is harmful to your skin? A sugar rush does more damage than small amounts of sugar in your daily diet. We hope that this discovery will motivate you to ignore the candy that comes home with your kids next Friday, or to bypass the sugary treats your coworkers are bound to bring out. 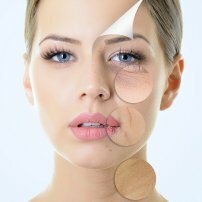 According to Acctifirm.com , when blood sugar spikes rapidly (as in a sugar rush), a process called glycation starts, where sugar attaches itself to collagen. This attachment makes the skin inflexible, leading to premature aging of the skin. This process is not limited to adults—although you probably won’t see it in kids, sugar is no respecter of persons. Did you need a better motivation to keep sugar off the table this month? Of course we can’t forget to mention this well-known side effect of sugar. You know that sugar will eventually travel from your tummy to your hips, but not all at once. And it’s not all about your waistline—it’s about your health in general. Long-term consumption of high amounts of sugar will eventually lead to insulin resistance, which poses a risk for all kinds of health problems—diabetes to high blood pressure to breast and prostate cancer. How does insulin resistance develop? When you eat sugar, you trigger a release of insulin, which is in turn a trigger for the body to store energy as fat. One Halloween sugar rush amidst a lifestyle of low- or no-sugar meals may not lead to the health risks listed above, but it will certainly lead to weight gain in the days following. Insulin resistance develops in conjunction with a high-sugar diet—check out the “Sugar’s Long-Term Effects Aren’t Sweet” section of this article to learn more. So you’re motivated to stay away from the sugar rush this Halloween, but don’t know if you’ve got the willpower to avoid sweets altogether. That’s ok. There are healthy alternatives to sugar! You don’t have to go the aspartame route to get a sweet fix. 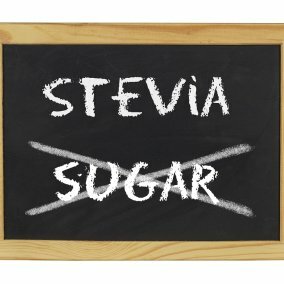 You can eat candy sweetened with stevia, an herb that has no affect on blood sugar. You can find candy sweetened with xylitol or maltitol, sugar alcohols (but don’t eat too much of these, either, as they can cause mild intestinal distress). 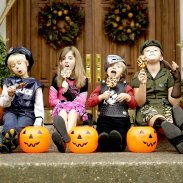 So get busy finding these safe alternatives to sugar to keep your sweet Halloween! Will you allow yourself a sugar rush anyway? If you want to avoid the inflexible skin of a sugar rush, or a risk of insulin resistance, you know how to find safe alternatives to sugar. But you don’t have to have candy copies. You can still party this Halloween with natural and creative delights— the fruit treats on this blog are just as fun as most sugary ones! Are you thinking you’ll dive into the sugar rush in spite of these facts? What’s your reasoning? Or have we convinced you to steer your family towards a healthier way this year? Tell us about it! We want to know, and so do our readers! The media has told us for decades to avoid fats if we want to lose weight and stay healthy. But what if we’re telling you today that fats can be good—and that you should eat more of them? We’re not talking about saturated fats found in things like fried food, of course. We’re talking about uncooked oils that you can drizzle over salads and fish to boost the flavor and satisfaction of a meal. Specifically, we’re talking about the health benefits of one Mediterranean staple: olive oil. Just what are the health benefits? For starters, olive oil isn’t saturated fat. It’s full of monounsaturated fatty acids, which are known to be healthy dietary fats. When you eat olive oil, you aren’t affecting your arteries. In fact, studies done on the Mediterranean diet have found that those who consume olive oil throughout their lives have a lower risk of cardiovascular disease like hypertension. Olive oil has been shown to reduce the risk of heart disease, prevent strokes, lower depression, reduce risk of breast cancer, protect against Alzheimer’s, maintain healthy cholesterol levels, and protect the liver. All that in one oil. If you don’t have any in the pantry, you better start stocking up! If you’re up on the growing popularity of olive oil, you’ve probably heard about the benefits of extra virgin olive oil. As its name implies, this type of olive oil is more pure and therefore has more health benefits. Extra virgin olive oil has not been highly processed. It is essentially just the result of olives pressed to extract the oil, and placed in glass jars for selling. Check out this website to learn more about the olive oil process and find out why you should be avoiding labels like “pure oil” in favor of the “extra virgin” one. While you’re busy rushing to the supermarket to gather bottles of this precious oil, you should keep in mind that it’s not always the best choice for cooking. This article points out that olive is great for uncooked settings, like drizzling over a salad or dipping bread, but is less awesome when it comes to frying. If you’re going to sauté vegetables over medium heat, go for olive oil. But if you need to fry something at a high heat, try oils with high smoke points, like coconut oil or butter. Olive oil’s smoke point—the point at which it literally begins to produce smoke—is also the point at which its good properties break down and bad ones take their place. As a rule of thumb, the smoke point of olive oil is between 365 and 420 degrees Farenheit. 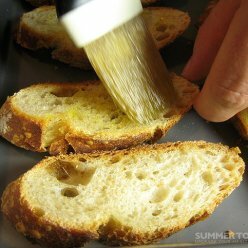 How do you like to use olive oil? 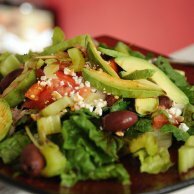 Extra virgin olive used in uncooked settings—on salads, over fish, for dipping bread, in hummus and other dips, as a garnish—is the perfect oily addition. If you need to fry at high heat, use something else, like butter or coconut oil. But bottom line—if you don’t have any olive oil in the cupboard, you need to rethink that right now! Try some of these olive oil-based recipes to get inspired. What’s your favorite way to use olive oil? Do you have a suggestion beyond what we’ve listed here? We would love to hear about it! One way we can make our blog relevant is to hear from our readers—so leave a comment now, and you’ll hear back from us very soon!